Onde Para Ser Escravo É Preciso Estudar -- Liga Estudantil Galega. What A Silly World Where To Be A Slave One Must Study - Student Union Of Galicia. The sticker shows a sketch of a young girl from the side with a thought bubble coming from her head. Inside the bubble is where the all of the text is place. 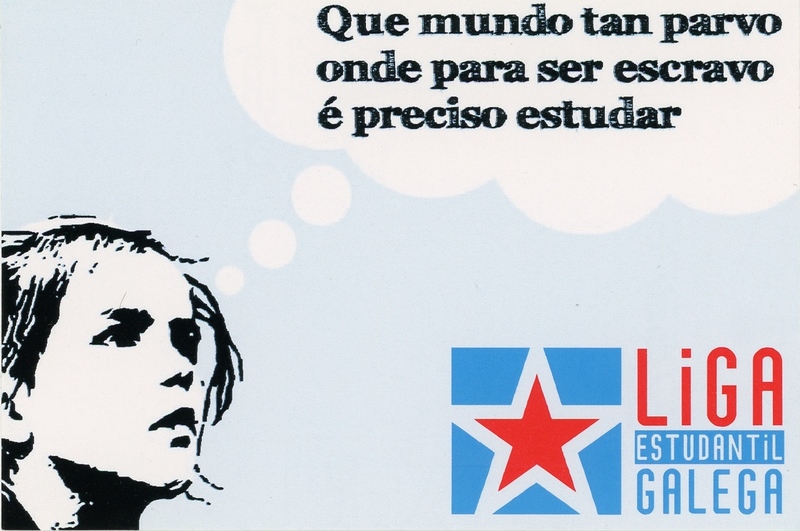 On the bottom right of the sticker is the red and blue star symbol for the organization Liga Estudantil Galega. This is a student union for public education demands a quality level of public, democratic, Galician education that is not patriachal. It is a socialist and feminist group that wants independence from Spain. The sticker is associated with the organization's platform to use have the Galiican language in all schools, a unique university program and increaded funding. Overall education has been a heated debate in Spain for many years now, especially from when the Partido Popular (PP) was in power and there was a 20% funding for schools.